As in, I’m done with the PVC drains and vents! What a relief. I had most of the rough plumbing done a few weeks ago, enough to install the subfloor & underlayment, but I still had a few things unfinished. So over the past week I rough plumbed for the tub faucet, shower head, and shower mixer valve. Seriously, I can’t even remember what it feels like to wash my hair without ducking or bending half over. I cannot wait. 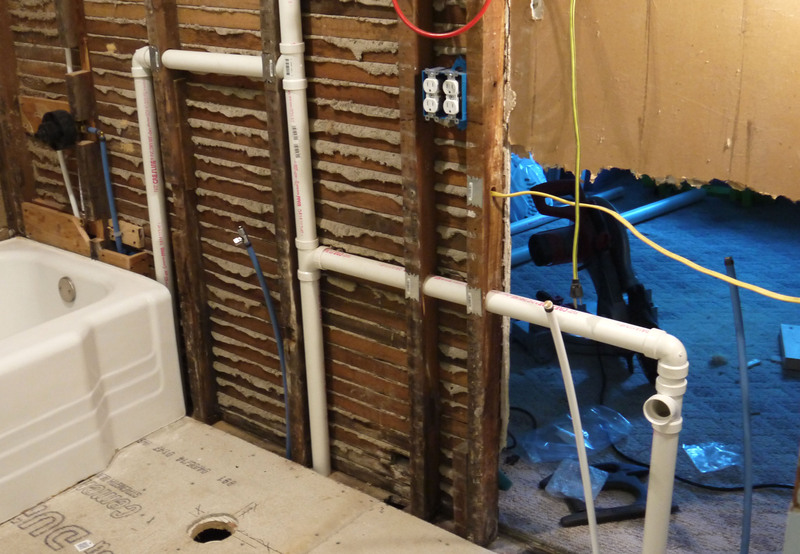 I also finished the tub drain & overflow – which meant carrying sliding the tub into place – and then I connected all 3 of the bathroom drain vents and ran that vent pipe up through the ceiling. Above are the three vents coming through the floor, connecting to a main vent, and then going up through the ceiling. Once through the ceiling the pip transitions to 2″ in the attic before exiting through the roof. And then bathroom was entirely ready for wallboard! 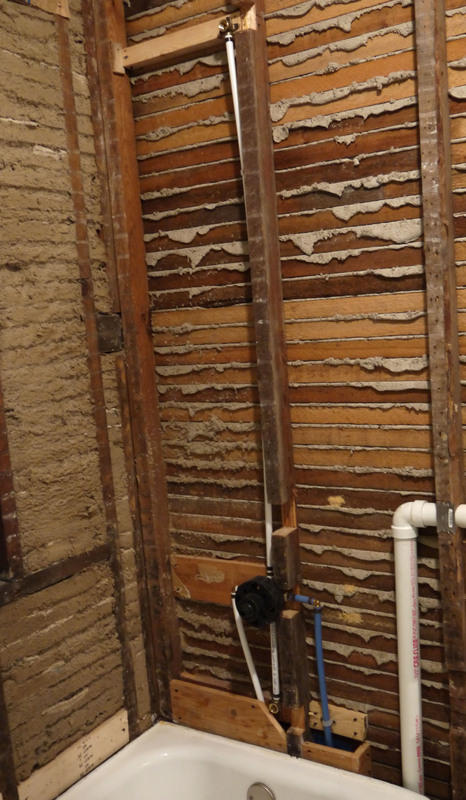 Based on everything I’ve read, I decided upon cement board on the walls around the tub/shower as a backer board for tile, but the rest of the bathroom walls will be moisture resistant drywall – often called greenboard. My brother-in-law helped me hang a few sheets of drywall Saturday, so the west bathroom wall is covered. I’ll do the same on the east wall. The south wall is staying plaster – with some patching around where the new light switches are. The bathroom is 5’8″ wide, and the tub is only 5′, which leaves me with a narrow space on the wall opposite of the shower head. 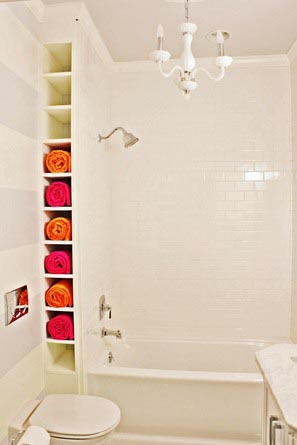 After some Pinterest searching, I came upon a great solution to use this narrow space- almost the exact size, too. Not my choice of colors for the towels, but you get the picture. It turns what would otherwise be unusable space into a little bit of storage. It will be fun framing it out, but if I do it right, it might also serve as handy access area to the back of the breaker panel in the wall behind (for future electrical updates needing additional wires). So to recap, below shows the different stages from just about a month ago to where I am now. I can almost see the finished product (thanks to the hours I’ve spent on Pinterest!). I actually got a lot done this week – kitchen sink, tub, part drywall, purchased wall tile for bathroom. But the biggest accomplishment was not mine, but rather what Dennis was able to get connected for me. The process itself is worthy of an entire upcoming post – wet floor, curse words, and a return trip to the hardware store – but for now, I’ll leave it at a single photo and one last sentence. I have hot water. Not physically myself, no. In fact, I couldn’t be more excited to leave work each evening and throw on dingy clothes to continue playing home renovation. No, getting drained in the sense that any flowing water can now find its way safely out of the house. Which, as Martha would say, is a good thing. I started with the kitchen sink, worked my way to the washer drain, and then to the existing soil stack. It already had an arm coming off from the old washer drain, so I made the connection between existing cast iron and new PVC pipe with a rubber flexible coupling (often called by the brand name Fernco). This was a pretty easy drain line. The kitchen sink will have a trap above the floor, so it meant installing a trap for the laundry drain, and then basically 2 straight stretches of pipe. Then this past weekend I tackled the bathroom drains. The worst part was ambiguously cutting pipes and assembling fittings when I didn’t have exact measurements down in the crawlspace where I was working. I mean, I have the bathroom planned out down to the inch, but without a floor, its just a space between the rafters. But if I laid the floor down now, then it is twice as much work to squeeze in and out of the crawlspace from the outside. (I never realized how convenient it is to have a hole in your floor!) So I did rough measurements, then fine tuned them until everything lined up both above and below the floor. It feels so nice to have pipes glued and sticking up through the floor. I still need to finish the PVC drain vents running up into the wall cavity, connect the three individual vents (sink, toilet, and tub), and run the main vent up through the roof. Basically, this photo shows what I am trying to accomplish. 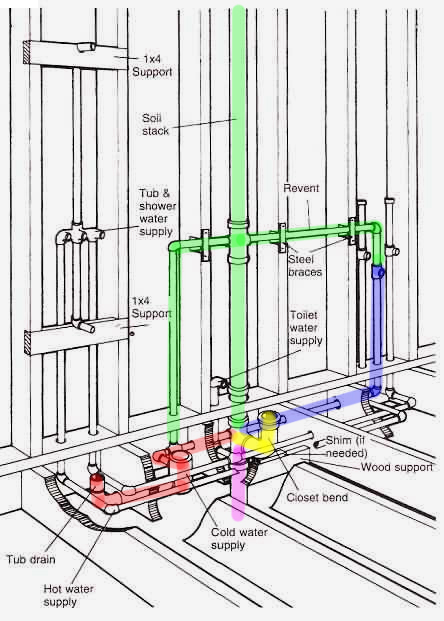 The red highlighter shows the bathtub drain; the yellow is the toilet drain; the blue is the bathroom sink drain, and the purple is where the drains all connect and go to the sewer line. 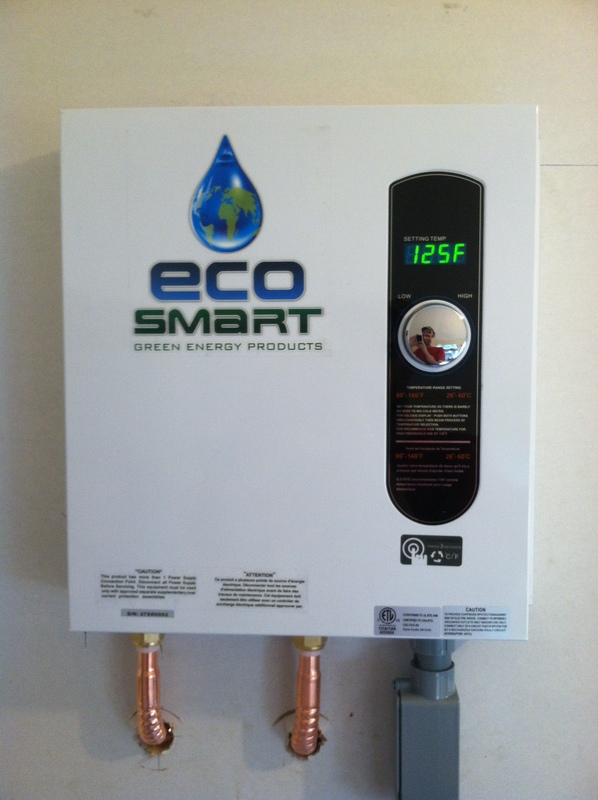 The green highlights the drain waste vents, which allow air into the pipes as the water drains out of each fixture. These vents prevent a vacuum when a sink or tub is draining, and eliminates slow draining tubs or gurgling noises when draining a full sink (tigers in the drain, as I’ve heard it called). These vent lines should be easier, I think. The measurements don’t have to be perfect to align with a fixture, and they will be hidden inside the wall and then up through the roof. Then its subfloor time, how exciting! From my research, everything I’ve read recommends a subfloor thickness of 1 1/4″ before laying tile. This is so the floor is strong enough not to flex and crack the finish tile or grout. And if I’m spending money on a nice tile floor, there will be no flexing going on. I decided on 3/4″ osb as the subfloor structure, and then 1/2″ cement backer board to to apply mortar and tile onto. The cement board is also very strong and sturdy, and will help support the floor but also give me a ready surface to lay down tile. The only down side is that the kitchen and bathroom floors will not be a smooth transition, but instead a 1/2″ higher on the bathroom floor. This is the minimum height allowable for most ADA floor transitions, so I think it will be rather unnoticeable with a nice transition piece.